Be the first to share your favorite memory, photo or story of Elba. This memorial page is dedicated for family, friends and future generations to celebrate the life of their loved one. 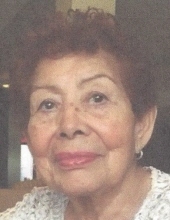 Elba M. Orellana ( nee Mancia ), 84, of Kearny died January 11, 2019 at her home. She was the beloved wife of Humberto Orellana; the devoted mother of Miguel Herrera, Anna Herrera, Celia Peck, Doris , William and Walter Orellana ; the cherished grandmother of 14 grandchildren and 19 great-granschildren. Relatives and friends are invited to attend the Funeral Service on Wednesday, January 16th at 9 a.m. in The Church of Jesus Christ of Latter-Day Saints, 130 Orange Street, Newark. Interment will follow at Holy Cross Cemetery, North Arlington. Visitation will be held on Tuesday, January 15th from 2p.m. to 8 p.m. at the Parow Funeral Home 185 Ridge Rd., North Arlington. To send flowers or a remembrance gift to the family of Elba M. Orellana, please visit our Tribute Store. "Email Address" would like to share the life celebration of Elba M. Orellana. Click on the "link" to go to share a favorite memory or leave a condolence message for the family.